The pianist recalls life before the opening nights. As a young student he moved to a wet Moscow just after the 1991 putsch, when the stores were empty and there was total uncertainty. 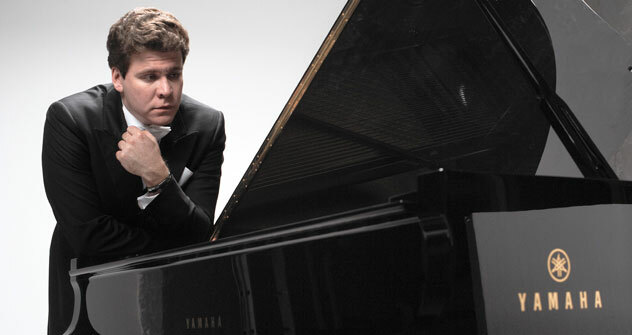 Seated at an oak table in an English pub in downtown Moscow, the casually dressed Denis Matsuev is just as charismatic as he is in tailcoats at a concert grand piano. But he also likes to micromanage: “Could you please turn down the music in this speaker so it doesn’t interfere with the recorder?” he asked the waitress. Matsuev, who is recording a new album, is even now concerned with sound quality. The 35-year-old pianist performs 160 concerts per year and cannot even remember how many albums he’s released – 18 or 19. Critics call him “a virtuoso in the grandest of Russian traditions» (the Gramophone), “the new Horowitz” (the Times) or sometimes even “a bear on stage” (la Scena Musicale), and he doesn’t seem to mind the latter. The story of this global triumph began 33 years ago in the Siberian city of Irkutsk, when the 3-year-old Denis walked up to a piano for the first time, reached up to the keys, and still unable to see them, repeated the melody he had just heard from the weather forecast on television with a single finger. Matsuev is also proud that he managed to tear down all notions about what a wunderkind should be. “Sure, I have an amazing ear for music. I can pick up any song in a second and learn any sonata in a few days, but I’ve never practiced for ten hours. I was a totally normal boy – I played hockey, football and broke my arm a few times,” he added. In fact, soccer (as it's called in the U.S.) almost interfered with the musician’s career. In April 1991, a delegation from the New Names charitable foundation came to the city in search of young talent. But Matsuev, a student at the Irkustk music school, was in no hurry to take part in the auditions. The 14-year old was seriously training for the Irkutsk junior football team. Six months later, Matsuev came to Moscow at the foundation’s invitation to take part in the filming of a program on talented children called Morning Star. He also managed to pass an audition at the central music school. Only one week later, he was faced with a difficult choice.